For the last couple of years, my little family has been making fun of all the hash-tagging. But then I was pretty much pushed onto Twitter by my publisher. (I know, I know, I’m an author, I’m supposed to be doing this.) I don’t know if I’m doing it quite right…but I’m enjoying it much more than Facebook. I like that everything’s so short and skimmable. I like that the tweets are almost universally positive and usually link to helpful content. I also like that no one seems to tweet about what they’re eating. When Building Your House was about to be released, my publisher and I chose a “Launch Date” that should have been a safe two or three days after the book went up for sale on sites like Amazon. Soon I started tweeting: it’s one week away… only a few days away… tomorrow! And then it was tomorrow, and the book wasn’t on Amazon. Flat tires, airport delays, lost money. Home repairs, illness, bad hair days, storms. People were disappointed and praising Him anyway. People were frustrated and praising Him anyway. And mostly, like me, people were waiting… and praising Him anyway. This week, when you find yourself feeling upset, disappointed, or waiting, toss it out there: #PraiseHimAnyway Post it on Facebook, Tweet it, or just say it to a family member or friend. 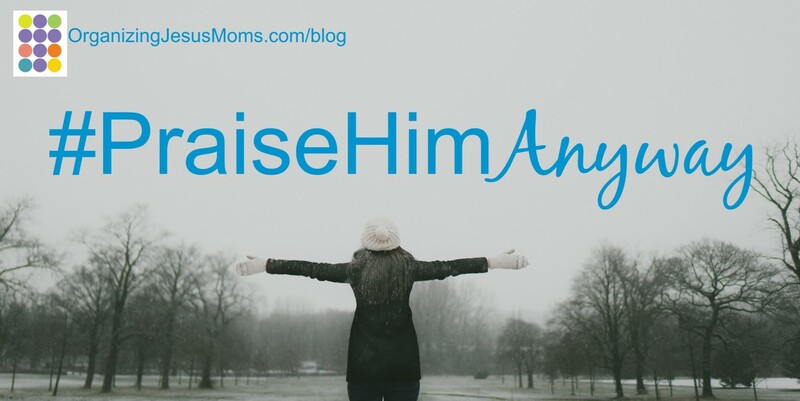 Even if your eyes are rolling when you say the “hashtag” part… praise Him anyway. How are you praising Him anyway today?